It's the first day of spring. Yay!!!! And it's supposed to snow tomorrow. Not yay. Right about now I am wondering when the warm weather is going to come to the Northeast because it seems like it's going to be never. All I dream about is going outside without my puffy coat on. A couple weeks ago it was in the 60s and it was SUCH A TEASE! My parents are currently at the Grand Canyon and they said it's snowing there too. Seriously, if you don't believe in global warming (and other climate related issues) you are dumb AF. Moving on from the weather, I have been having terrible anxiety during the night and I've been waking up at like 3am and making a mental to-do list. Of course, then I can't fall asleep until 5am and the next thing I know it's time to get up for work and I feel miserable. I've been trying to figure out how to combat this and am thinking of going to therapy so I can talk through my anxiety. Truly, I think that having a vacation would help me, but I don't really have anywhere to go right now. And then to top it off, I saw that the last male northern white rhino died today and I cried about it on the subway. I don't mean to be totally weird but sometimes writing about this stuff helps me process my thoughts and feel better. It helps me take a step outside of my own head and examine my own thoughts, which is calming in a way. If anyone has any tips/advice, please let me know! I'm posting this recipe as a tribute to my boyfriend, Pat, who is the chili master. It's his favorite meal (I think) and he cooks it every couple of weeks, sometimes with beef. I typically only eat it when he makes it with ground turkey and while I'm not a super huge chili fan myself, his is pretty tasty. 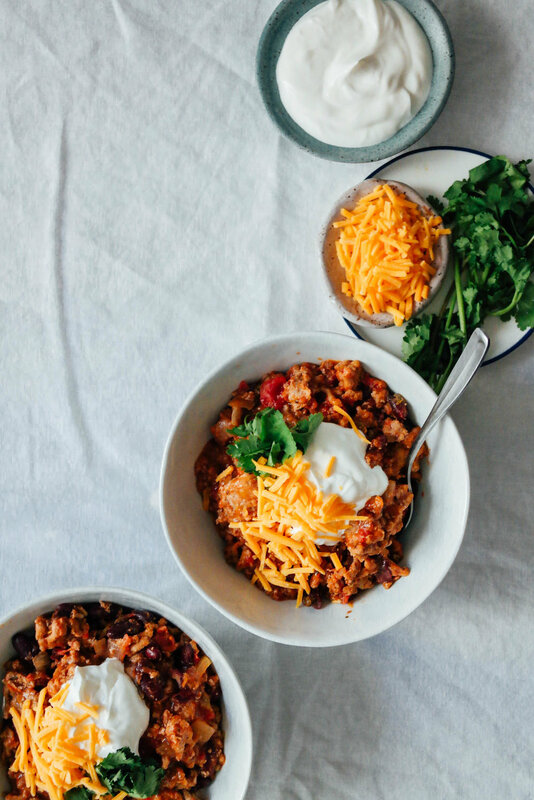 While he informed me that true chili takes hours to cook and that we really need to invest in a slow cooker, he's come up with a quicker version that's pretty unreal. The longer you cook it, the better, but you can easily make this in 45 minutes if you need dinner fast. In a large heavy bottom pot, simmer olive oil, garlic, salt, and ground turkey on low. Keep stirring until the turkey is cooked. Add in chili seasoning, paprika, spices, beans, and tomatoes and mix together. Cover and simmer for 45 minutes until everything is mixed together. Serve warm with preferred toppings!